I have often been asked if there are inexpensive solutions to firing an electronic flash in response to the explosion of a balloon or the shattering of glass by a hammer or similar loud events. Well, there are several methods that have been used by photographers over the years but none is probably as reliable, sensitive and quick as a circuit described by James Bailey in Modern Photography many years ago although his approach was also the basis on which some simple tube-type synchronizers operated and which were described many years previously. Unless one is talking about mechanical synchronizers (and even with them sometimes) one of the concerns of photographers is to amplify the sound so that the signal can be used to trigger some kind of switch to which the flash is connected. While one could get quite involved in building a sound detector and amplifier circuit, a ready source of such a device is a simple cassette or microcassette tape recorder. The only requirement is that it should have the capability of monitoring the recordings it makes. This means the recorder should have an earphone jack that remains active as recordings are made. Additionally, it is advisable to locate an early model cassette tape recorder because these usually had a built-in VU, or recording strength, meter. One could manually adjust the recording volume at will. One would simply make the VU meter's needle rise just to the red mark on the VU meter while recodring. Such tape recorders are now considered old fashioned and too basic. They are too "manual", and in modern tape recorders an "auto level control" is included in the recorder for unattended operation. In any case, those old tape recorders are often available at surplus houses and flea markets for less than $10. The switch that will cause the flash to operate is called an SCR and there are several types that can be readily used. One that I would recommend is the BRY 55 400. The BRY 55 is available in several voltages but for electronic flash control the 400v capable is recommended. Below are given specification numbers for several other appropriate ones. An SCR is a Silicon Controlled Rectifier. It has a variety of possible applications in electronics but its function in our application is to serve as a simple switch. This SCR switch is activated by the signal the tape recorder feeds to the earphone jack when it is set in the record mode and its microphone detects sounds. Thus the earphone "output" signal needs to be fed somehow to the SCR. How this is done is described below. The SCR has three connections. One is called the "A" (for Anode) connection, the second is "C" (for Cathode) and the third is "G" (for Gate). Besides the SCR you will also need a male plug that will fit into the earphone jack of the tape recorder you get. This will typically be a 1/8th inch mini-plug or a 1.5 mm subminiature plug. To complete the items required to build the synchronizer it is convenient to procure a PC to PC extension cord. This cord will have a male PC connector on one end and a female one on the other end. The former is the kind that fits into the camera's PC socket. Anyway, cut off the other, female, end about 6 to 12 inches from the plug and strip the black covering exposing the two inner wires (or a single wire surrounded by a wire mesh). Strip the covering from the ends of the two inner wires that are now exposed (or strip the end off the central wire and twist the outer cover into a single, outer "strand". Now, following the illustration, you need connect the "C" and the "G" connectors of the SCR to the two contacts of the mini (or micro) plug. Then connect the "A" and the "C" leads from the SCR to the two wires of the female PC connector. You might want to do this on a provisional basis first as sometimes you will need to reverse the connections. Other SCR's would be connected up in similar fashion as shown here illustrating the hookup with an ECG54003LS3 SCR. Their input leads may be arranged in a different order than that of the BRY55's or EC1030's but the idea is the same. Just keep the "A", "C" and "G" connections straight! Once the circuit is completed plug the sync's plug into the tape recorder's earphone jack. 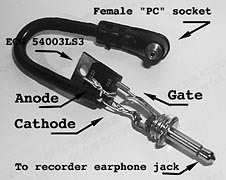 Place an empty tape in the recorder and turn it "on" as if you were about to make a recording (or fool it into running without a tape in it) and then plug the sync cord of the flash into the female connector attached to the SCR's "A" and "C" contacts. The flash might go off at this time. If you have a tape recorder with an adjustable recording volume control set it to the lowest value and increase it slowly. At some point the flash should fire. If it does not, disconnect the flash and reverse the connections from the PC connector to the SCR. That is, take the wire that went to the "A" contact and connect it to the "C" contact and move the "C" one over to the "A" one. Now reconnect the flash and repeat the process described above. The flash now should fire either as you raise the volume control or as the microphone is exposed to a loud sound. In fact, if things are working well, you should find that the sensitivity of the unit is so high that even the slightest nose will set off the flash. It is advisable to set the flash to a low power if possible to save on batteries or to just not discharge a full blast as you are simply testing the unit. If you are using a more modern tape recorder with built-in auto-level control, you may find that when there is even the slightest sound present the flash will fire. The device may even be so sensitive as to set off the flash by the sound of the shutter clicking open. If this is the case you will need to take special precautions such as covering the lens of the camera at the time the shutter is opened (causing the flash to fire) and before making the event happen, removing the covering so that when the sound of the event causes the flash to go off the shutter will be open. Sometimes the flash might fire more than once as small, secondary, sources of sound will fire the synchronizer repatedly. You should be prepapred to quickly replace the cover after the "main event" is over. 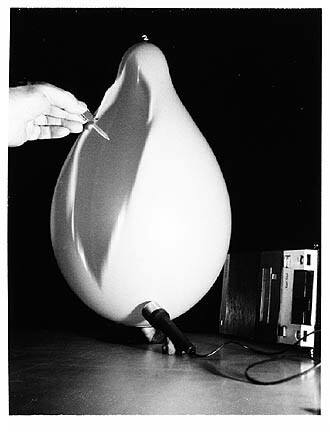 Ultimately, when you become engaged in trying to make high speed photographs of shattering balloons or lightbulbs or eggs or whatever, you will still probably want to set your flash to partial power since at these levels the flash will give you very short bursts of light. By the way, typically you will be doing high speed photography with such a synchronizer with the ambient lights reduced to a minumum or possibly totally in the dark. The reason for this is that you have to open the camera's shutter previous to the event taking place so that it is open at the time the event and flash happen. If there were significant amounts of ambient ligth present this would spoil the film. So, previous to making a shot, the subject or event should be carefully preplanned so that it can be executed with the "lights out". 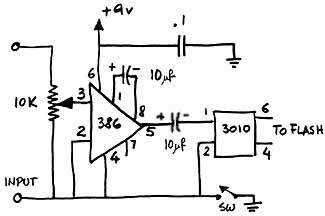 In addition to the simple tape recorder plus SCR synchronizer described above, if you are proficient or adventuresome with electrical circuits you might attempt making a more complex device based on the use of a very basic amplifier integrated circuit, a microphone and an opto-isolator. The schematic is shown here. 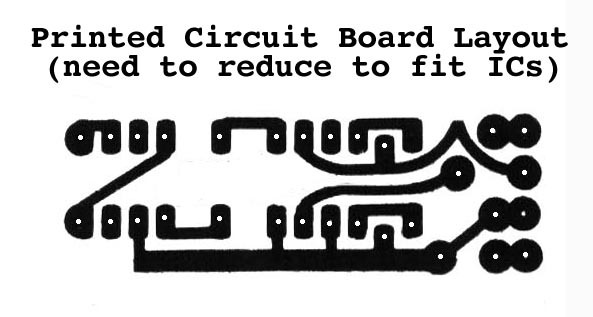 A Printed Circuit board layout is also provided as well as the view from the component side of the PC board. As you can see it consists of very few parts and you can either put this together using the PC board layout or it is even possible to use point to point wiring or build it on a wire-wrap board or a protoboard or another formalized prototyping assembly system. You will need the following parts. Most (other than a PC sync cble from which you will need to remove the female end as described for the project above) can be obtained at Radio Shack although a surplus electronic house will probably be much cheaper. 1 Plastic Box about 1" x 2" x 4"
The LM386 is the amplifier, the 3010 is the switch, and the rest are basic signal trimming components. The total cost for parts should not exceed $10. Detailed construction steps are not provided. It is assumed you know how to follow the instructions based on the information provided in the schematic and the printed circuit board layout provided above. Note that the output from the 3010 is "polarized" and if the device does not fire a flash after it is connected, one possible rason might be that the connections from the female PC socket need to be reversed as they connect to the 3010's output. As with the SCR-tape recorder combination, this circuit will also fire a flash the instant that it detects a loud enough sound. It does so with a miniumum of delay between detection and flash firing. 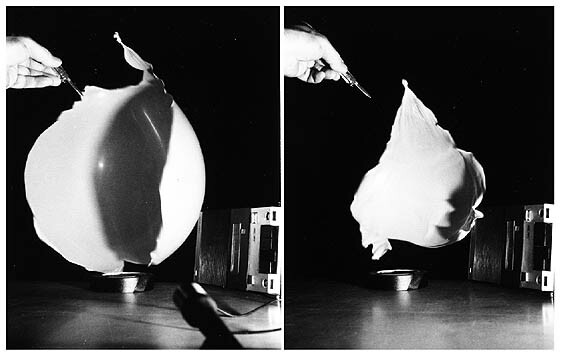 As shown in these photographs, in certain situations having a small or variable delay between the onset of sound and the firing of the flash is desirable. This can be accomplished by placing the synchroniozer further away from the source of sound. You gain a delay of about 1/1000 second for each foot of distance that you introduce between the source of sound and the synchronizer. These photographs were made with the microphone moved about 1 foot and 2 feet from the position where it was when the photograph at the top of this page was made. As you can see, in about a 1/500 of a second much of the balloon has all but disappeared! For long delays it becomes impractical to move the synchronizer and in these cases a second circuit is added to the basic detection circuit. The simplest timing device that can be added is one based on the 555 IC timer chip. To learn more about how a sound, light and dark activated synchronizer including variable electronic delay might be built, please consult another article: Photographing Wasps in Free Flight. This article has been requested times since April 15, 1999, when it was installed. Select MORE ARTICLES for links to more!.